A Chalmers-led team of astronomers has for the first time observed details on the surface of an aging star with the same mass as the sun. ALMA's images show that the star is a giant, its diameter twice the size of Earth's orbit around the sun; they report that the star's atmosphere is affected by powerful, unexpected shock waves. The research was published in Nature Astronomy. The team, led by Wouter Vlemmings of Chalmers University of Technology, used the Atacama Large Millimetre/Submillimetre Array (ALMA) to make the sharpest observations yet of a star with the same original mass as the sun. 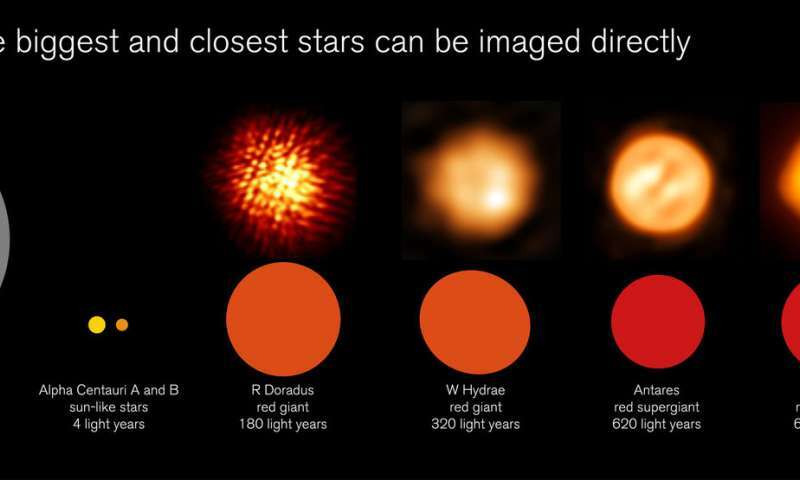 The new images show for the first time details on the surface of the red giant W Hydrae, 320 light years distant in the constellation of Hydra. W Hydrae is an example of an AGB (asymptotic giant branch) star. Such old stars are cool, bright, and lose mass via stellar winds. The name derives from their position on the famous Hertzsprung-Russell diagram, which classifies stars according to their brightness and temperature. "For us, it's important to study not just what red giants look like, but how they change and how they seed the galaxy with the elements that are the ingredients of life. Using the antennas of ALMA in their highest-resolution configuration, we can now make the most detailed observations ever of these cool and exciting stars," says Wouter Vlemmings. Stars like the sun evolve over timescales of many billions of years. When they reach old age, they become larger, cooler and more prone to lose mass in the form of stellar winds. Stars manufacture important elements like carbon and nitrogen. When they reach the red giant stage, these elements are released into space, ready for use in subsequent generations of new stars. 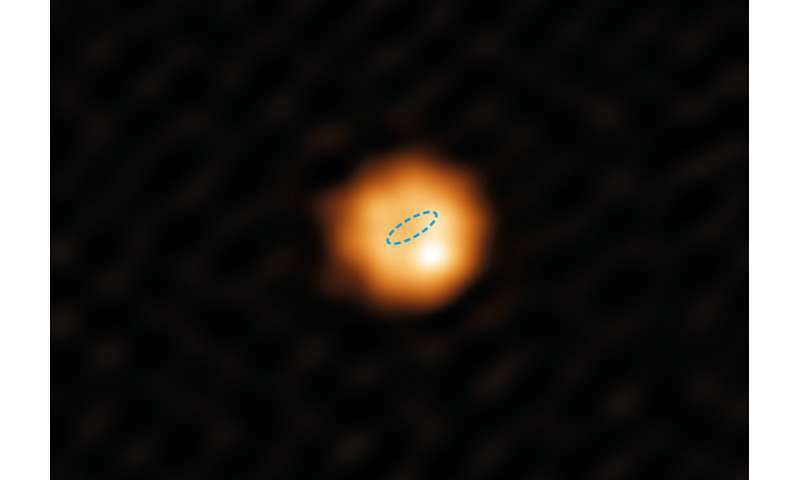 ALMA:s images provide the clearest view yet of the surface of a red giant with a mass similar to the sun. Earlier sharp images have shown details on much more massive, red supergiant stars like Betelgeuse and Antares. The observations have also surprised the scientists. The presence of an unexpectedly compact and bright spot provides evidence that the star has surprisingly hot gas in a layer above the star's surface, a chromosphere. "Our measurements of the bright spot suggest there are powerful shock waves in the star's atmosphere that reach higher temperatures than are predicted by current theoretical models for AGB stars," says Theo Khouri, astronomer at Chalmers and member of the team. An alternative possibility is at least as surprising— that the star was undergoing a giant flare when the observations were made. The scientists are now carrying out new observations, both with ALMA and other instruments, to better understand W Hydrae's surprising atmosphere. Observations like these, using ALMA's highest-resolution configuration, are challenging, but also rewarding, explains team member Elvire De Beck, also astronomer at Chalmers. "It's humbling to look at our image of W Hydrae and see its size compared to the orbit of the Earth. We are born from material created in stars like this, so for us it's exciting to have the challenge of understanding something which so tells us both about our origins and our future," she says. The results were presented in the paper "The shock-heated atmosphere of an asymptotic giant branch star resolved by ALMA," published online in Nature Astronomy. 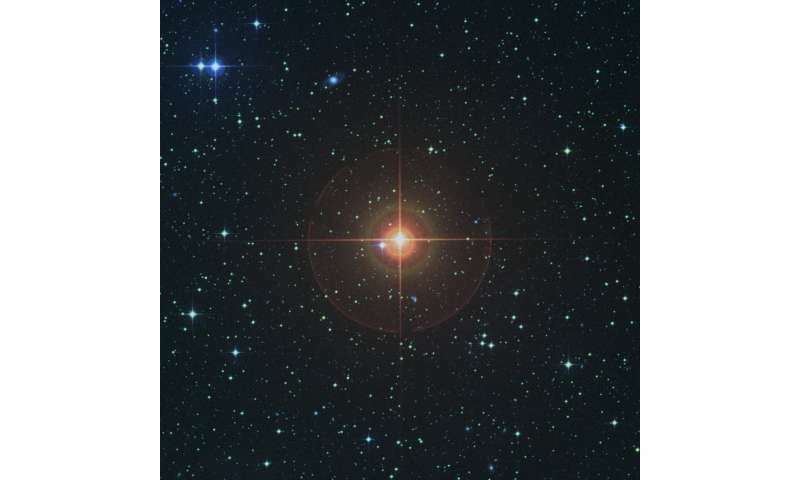 Safe and remaining 76.45% red (M) stars 0.08-0.45 mass Sun; ≤ 0.7 R Sun; 2,400-3,700; which are similar to the temperature of W Hydrae 2,500-3,129 ° K are inflated giants in science. Are bloated stars or authors? Important with all the talk about the recent neutron star collision simultaneous GRB and GW detection in August and particularly its R-process creation of heavy elements to note that this type of star creates elements by the S-process and ejects them by stellar wind, a different type of interaction than that seen with the GW/GRB neutron star collision. These two must not be confused. Very interesting as these types of stars might be the origin of most of the elements that make ices, which are implicated in the spontaneous creation of life. Ices contain the relatively light elements like carbon, oxygen, and nitrogen. Other elements created by these processes include phosphorus and silicon, running up to iron. The bulk of the Earth is made from these elements.